All Jugheads, parents and staff will enter/exit St. Stephen’s through the west side lower-level courtyard entrance off Wooddale Avenue. To park and enter, please use Utley Park, Wooddale Park or 50th Street (west of Wooddale Avenue). All of our areas are on one level (with an adjoining ramp). This makes it easy to locate kids upon parents’ arrival. NOTE: On school year Wednesdays, the church sets up for their weekly 6 p.m. dinner starting at 5:30 p.m. For this reason, we’ll put away our props at 5:30 and move to the Commons for the remainder of club on Wednesdays only. 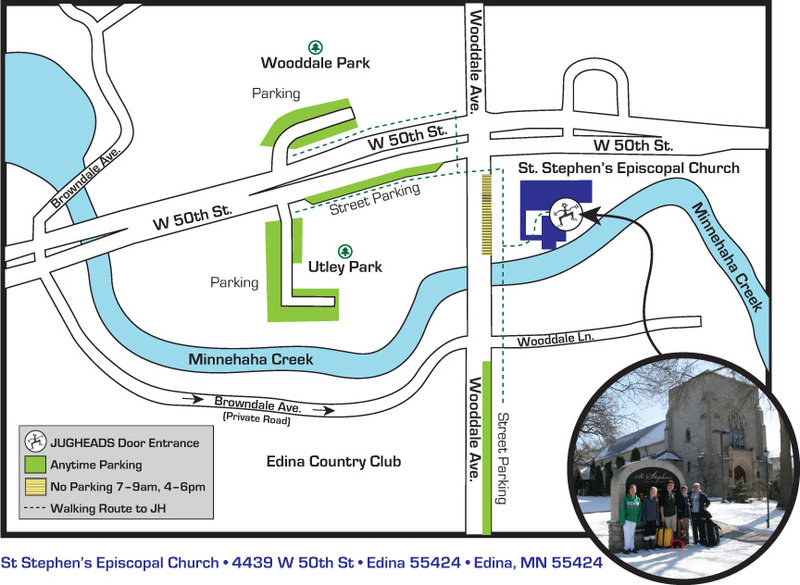 PACKS, SNACKS, BIFFIE & BIKES: As Jugheads arrive, they’ll put their belongings in the hallway to the right of our entrance between our office/storage area and our snack area (The Commons, overlooking Minnehaha Creek). Our bathrooms are across The Gathering Space to the left of our entrance, and the church will install a bike rack in the courtyard. ACTIVITY AREAS: During most of our club/camp time, two main areas will be open: The Gathering Space and the Commons. Weather permitting, we’ll allow juggling in the courtyard/patio, with occasional trips to Utley or Wooddale Park led by our Student Leadership Team. CELL PHONE RECEPTION: We ask parents for patience if Paul or your child doesn’t respond to texts or calls right away during our clubs/camps. We will have reception in our office and Commons, but the cement structure of The Gathering Space makes cell use infeasible. Paul will retrieve messages every 15 minutes or so as he moves among our rooms.